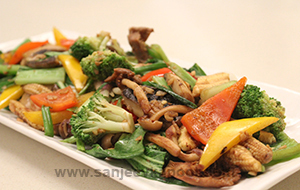 Exotic vegetables make a delicious stir fry. Discard stems of mushrooms and chop roughly. Halve water chestnuts. Add garlic to the wok and sauté till golden. Add onion and sauté till golden. Add baby corn and toss. Add halved water chestnuts, toss and cook for a minute. Add mushrooms and toss. Add red bell pepper and cucumber and toss. Add soy sauce, salt, brown sugar, crushed peppercorns and cashewnuts, toss and cook for a minute. Add salt and broken fried basil leaves and toss. Serve hot garnished with fried basil leaves.